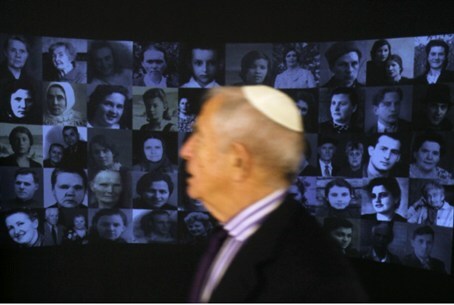 Some 300 guests and dignitaries marked the grand opening of Jewish Community Center and Holocaust Museum in the Ukraine. Some 300 guests and dignitaries attended a ceremony on Tuesday in advance of the grand opening of the Menorah Jewish Community Center and Holocaust Museum in Dnepropetrovsk, Ukraine. The complex hosts an Institute for Jewish Culture and a gallery that features photographs of 40 major synagogues in Dnipropetrovsk before the Nazi occupation, as well as video footage about the Holocaust. The ceremony was attended by, Israeli Minister for Diaspora Affairs Yuli Edelstein; Chief Rabbi of Dnepropetrovsk Shmuel Kaminezki, Sephardi Chief Rabbi of Israel Shlomo Amar, President of the Federation of Jewish Communities in the CIS Lev Leviev, and, Rabbi Moshe Kotlarsky of Lubavitch World Headquarters. Edelstein praised efforts to revive Jewish heritage and culture in Dnipropetrovsk. "The real achievement will be when we get here in a year from now, in two years from now, and we will see this place full of kids, full of different Jewish activities, full of different organizations working here," Edelstein said. "I think that this will be the real answer to what Nazis and communists tried to do to Jewish communities in the Ukraine and in the former Soviet Union." The seven-tower, twenty-story museum and center multiplex, which was built at an estimated $60 million, will officially open Oct. 21. The opening exhibition, “Wanderings of the Children of Israel,” will elucidate the story of the Jewish Diaspora in Ukraine by artists from Ukraine, Germany and Israel. According to museum organizer and curator Marina Shelest, the exhibition’s theme of Jewish wandering is essential to the story of its featured artists. "Wanderings, voluntary or forced, are the biography of every Jew, and the artists that are represented in this show are no exception,” she said, according to Lubavitch.com. While the center will help fill the spiritual and physical needs of Dnepropetrovsk’s 50,000 Jews and the broader Jewish community, the Holocaust memorial will serve as an important educational medium, teaching visitors about the region’s Jewish history. In a 2008 interview with Lubavitch.com, Zelig Brez, executive director of the Jewish Community of Dnepropetrovsk, expressed his excitement for the role the museum will play for the entire population of Dnepropetrovsk. “The [museum] ... plays an important role in the development of the entire city. Today’s generation [of Ukrainians] has a very limited understanding of the Holocaust, and we must change that,” she said.